A persistent drought has left nearly 23 million people across the Horn of Africa without enough to eat. In South Sudan, hundreds of thousands are trying to survive famine. Nearly half the country—or 4.9 million people—are now going hungry. That number will grow when the “lean season” arrives in July, just before harvest and as food reserves have been exhausted. 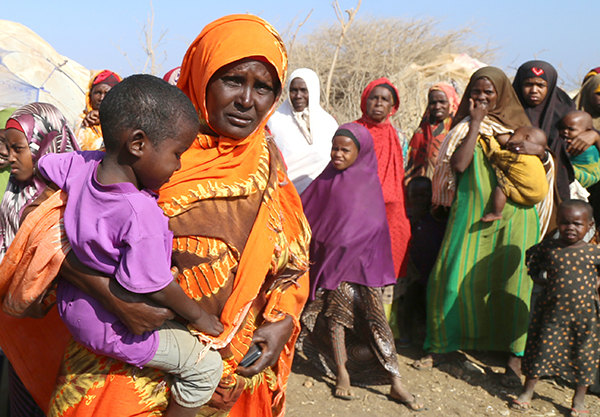 The world’s last declared famine, which lasted from 2010 to 2012 in Somalia, resulted in 260,000 deaths. The drought is compounded by decades of violence that many hoped would end in 2011 with the country’s independence. Instead, a civil war broke out, and millions have been forced from their homes and farms. Many have fled to neighboring countries. Meanwhile, in Somalia, also plagued by decades of civil unrest, the newly elected government has declared the current drought a national emergency, with rains over the past 2 years that have been either insufficient or, in many places, nonexistent. The United Nations is warning that without enough rain by the end of April, famine is likely there too. The Red Cross in Kenya says 2.9 million people are facing severe hunger. And in Ethiopia, 5.6 million people will be dependent on food aid until the next harvest. Catholic Relief Services is providing food assistance to hundreds of thousands of people in Jonglei State, where there is severe hunger, but famine has not been declared. “There’s really only a marginal difference in how bad off people are,” says Jerry Farrell, CRS country representative in South Sudan. CRS provides food in exchange for labor to build community infrastructure such as dikes and roads, and we supply direct food aid when violence prevents work on these projects. “In the end, the community gets food, and they have new roads or other assets—a benefit to the whole community. Working together also strengthens the social fabric in a country that has known decades of war,” Farrell says. In partnership with the U.N. World Food Program, CRS airdrops food supplies into areas that are difficult to reach because of insecurity or a lack of infrastructure. CRS staff then hike for days to reach those locations, and coordinate the distribution of food. “There’s a lot of excess food in the world, but it’s a logistical challenge getting food to the right places at the right time,” Farrell says. CRS also teaches people to repair boreholes, a water source. “We respond to emergencies because we’re a humanitarian organization but we also understand that, at the end of the day, people deserve dignity and self-respect, and that requires an expanded approach,” Farrell says. In addition to delivering food, water and health services, CRS provides supplies including seeds, tools and fishing nets. 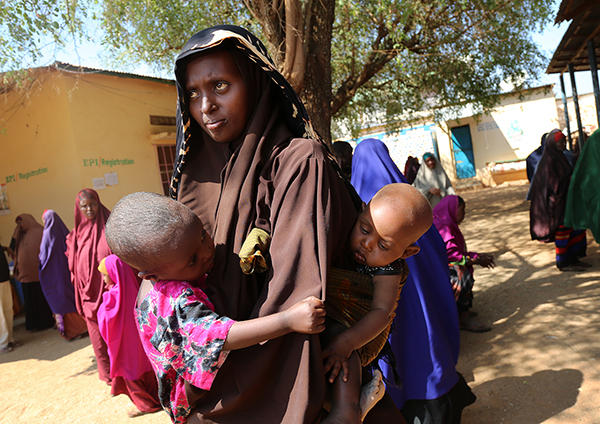 In Somalia, CRS uses U.S. government funding to provide emergency food aid for those displaced by violence and the threat of the Islamic extremist group al Shabaab. CRS also assists growing numbers of climate refugees. We provide cash, transferred via mobile phone, allowing people in rural areas affected by drought to buy food and water. CRS’ emergency response focuses on the rural areas in south central Somalia and near the Kenyan border to help keep farmers—many whose livestock are dead or dying—from giving up everything and migrating to overcrowded, strained temporary camps for displaced people. In Kenya, CRS helps improve families’ access to water in some of the country’s most arid regions. This work, also funded by the U.S. government, includes providing water to animals and using innovations like solar-powered sensors that indicate when wells are low. In the coming months, CRS hopes to build upon this groundwork to help rural families—both farmers and herders—to cope with the drought and prevent violent conflict over scarce resources. CRS is partnering with the Ethiopian government to provide food aid in exchange for work on roads in rural communities. The ultimate goal is for people to get out of extreme poverty and become self-sufficient. While this support has helped many people through a devastating drought caused by El Nino last year, serious food and water shortages continue to affect parts of southern Oromia and the Somali regions. CRS is assisting nearly half a million people through emergency food aid and water distributions.